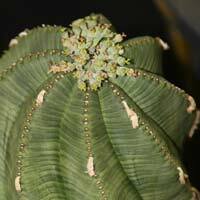 Succulent plant are available for sale online include a wide range species. Some cultivars and varieties suited to growing in the garden, others are best grown in containers. Making great garden plants as well potted specimens and as indoor or house plants most varieties are easy to care for. Although they do come from a wide range of conditions generally they require excellent drainage and part to full sun. Trailing succulents are excellent for hanging baskets as well as for cascading over low garden walls, while creeping species make great ground cover plants. Propagation of succulents is from seed or from stem or leaf cuttings. Increasingly popular with garden landscapers, in the home garden, and as house plants, succulents are both drought tolerant and available in many beautiful and fascinating forms, many through hybridisation. Plant are available as tube stock through to advanced specimens. These plants are able to adapt to dry conditions due to their ability to store and retain water. Water retention tends to give plants a swollen appearance and this is refereed to as ‘succulence’ hence the name Succulents. Combined with a waxy or prickly surface to leaves and a metabolism that is adapted to dry conditions, succulents are ideal as a low maintenance, low water requiring plant they use use different parts of their systems to store water depending on species. Leaf Succulents such as Aloes and Sempervivums store moisture in their fleshy leaves. Is it a cacti or a succulent, well all cacti are succulents, but not all succulents are cacti. 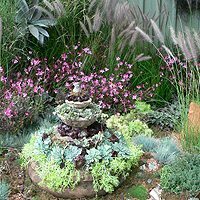 Succulents are ideal as container garden plants. In general succulents do well in any well drained sunny position. However growing succulents in pots of containers is very popular. By nature pots and containers are well drained, they can also be easily moved to a sunny position or brought indoors during winter months in cooler climates. So with literally hundreds of varieties available from the Agavaceae family which includes Agave and Yucca to the Zygophyllaceae family their really is an incredible range available. When looking at succulent garden design, Guilfoyle’s Volcano at the Royal Botanic Gardens in Melbourne (picture below) is an excellent example of clever use of succulents in garden design on a large scale. Circular pathways lead us to the top of the ‘volcano’ which is actually a reservoir. Succulents have been used to represent lava flows, huge variety and some excellent plantings.